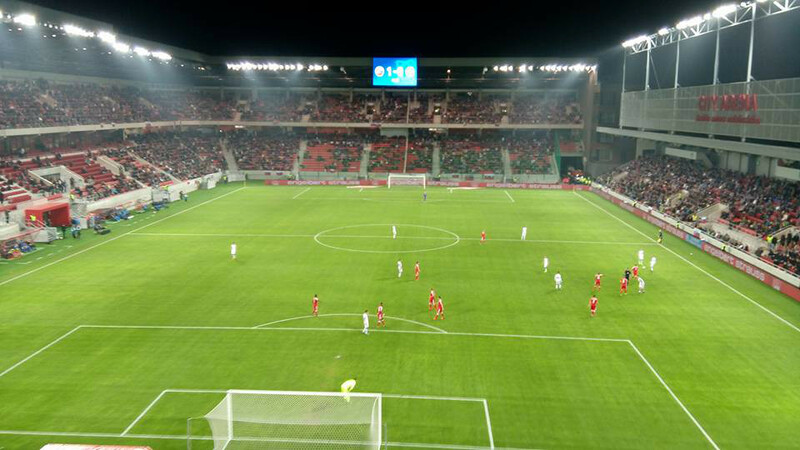 Stadion Antona Malatinskeho, also known as City Arena Trnava, is the recently opened new home of Spartak Trnava. The new arena got built in place of Spartak’s old home with the same name. Demolition works on the old stadium started in Match 2013, but one stand was kept standing during the 2013-14 season so that Spartak could keep playing their home games at the ground. Stadion Antona Malatinskeho officially opened on 22 August 2015 with a friendly between Spartak Trnava and Brazilian side Atletico Paranaense. In the years following the opening of the stadium, it became a frequent playing venue for games of the Slovakian national team. Stadion Antona Malatinskeh is located right in Trnava’s city centre. It lies right on the southern edge of the historic town centre, a few hundred metres from the central square. The stadium itself is part of a larger new development including a shopping mall and cinema. Trnava’s main rail station is located a little further south-west, a short walk of less than 10 minutes. Direct trains from Bratislava run at least once an hour. The journey takes roughly 30 minutes. Tickets for Spartak Trnava games can be bought online through Maxiticket, or at the shop in the City Arena mall. Tickets cost either €7.00, €9.00, or €12.00 for central padded seats. You can find a seating plan here. Email support@maxiticket.sk for more information. Trnava.sk – Trnava city information.